This is looking like the year Southwest Georgia economic development leaders make the big jump from optimism to excitement. The 25-county region’s longtime economic mainstay, agriculture, is breaking records, existing industry is healthy and showing signs of growth and the phones are starting to ring more often as prospects check out the area. “One of our biggest success stories,” he says, “is our Pecan Grove Corporate Park.” It’s doing so well ADEDC is now rushing to get all utilities in place for its 225-acre Albany-Dougherty Industrial Park. “We’re always preparing for the future, and we want to be sure we have sites ready when companies come looking,” Strickland says. And companies are definitely looking, especially since the City of Albany and the commission announced a $30-million job investment fund, the largest such deal-closing fund in Georgia. The money would be used to reimburse companies for expansion-related expenses as an enticement to bring companies to the region, generating jobs, recharging the area’s tax base and hopefully leading to an economic boost. “Our phones have been ringing ever since the fund was announced, and we hope to have a project in 2014 that will meet the criteria,” Strickland says. Eligible projects must create at least 100 jobs or invest at least $10 million within the first three years. Strickland’s excitement about the new year is echoed by many of his counterparts in the region. Brian Marlowe, president/CEO of the Tift County Development Authority and the Tifton-Tift County Chamber of Commerce, says he’s “very optimistic” his community will be seeing a lot more economic development activity this year. Helping fuel that optimism is a major expansion by American Textile Company. The company, which opened a Tifton bed pillow manufacturing facility just three years ago with 100 employees, broke ground in late January for an expansion that will bring the company’s total space to more than 400,000 square feet and double its workforce over the next five years. Valdosta-Lowndes County has also been busy preparing for anticipated future growth. Schruijer says she’s seeing “a good pipeline of projects” for new business, especially manufacturing and retail. Economic activity is also looking better for other Southwest Georgia communities. The two big projects are a new $45-million high school and a $30-million renovation and expansion at Colquitt Regional Medical Center in Moultrie. “We have a lot going on, and we’re moving forward,” says Lisa S. Collins, director of economic development for the Cook County Economic Development Commission. Collins says the airport improvements have already helped attract a new company, Catalina Tempering, a tempered glass manufacturer. Lee County’s Winston Oxford says he believes his county has just about weathered the recession storm and is getting back on track for growth. “By the end of last year, our unemployment rate had dropped back to almost the levels before the recession hit, and our sales tax revenue has really rebounded,” says Oxford, executive director of the Lee County Chamber and Development Authority. Shelley Zorn started 2014 in a new place but with a familiar job. Zorn, who handled economic development as the longtime president of the Ashburn-Turner County Chamber of Commerce, became executive director of the Thomasville-Thomas County Development Authority in January and barely took time for a second breath before hitting the road in her new community. 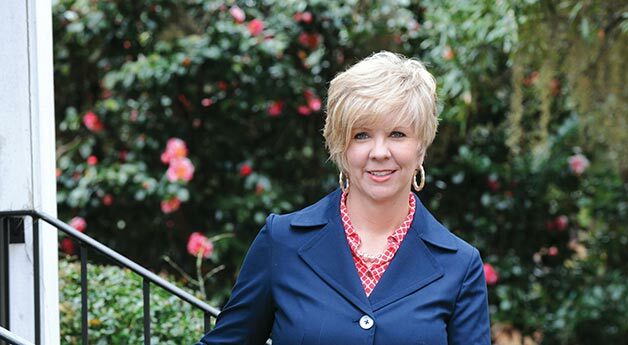 Tina Herring, director of the Brooks County Development Authority, says 2014 is off to a good start for her county with a new chip mill in operation and “several prospects” knocking on the door. Cordele-Crisp County leaders started preparing for the economic turnaround several years ago, and Bruce Drennan, executive director of the Cordele-Crisp County Industrial Council, says it looks like that time is coming soon. An important part of the community’s plan for the future is the Cordele Intermodal Center, an inland port that serves as a staging area for container cargo going to and from the Port of Savannah. Companies can bring their cargo to the Cordele facility, where it is shipped by rail car to Savannah and loaded directly onto a ship.